A tight 70 lap race on the Hungaroring circuit, the Hungarian Grand Prix greeted the 2010 Formula 1 series running their last race before a nearly one month break until Belgium. With a lot of new equipment likely to roll out by the late August race, this is possibly the last opportunity where news honestly know where they stand on the F1 grid. Rain and thunderstorms held off for the running of the Hungarian Grand Prix as the 24 car Formula 1 field took start topped by the two Red Bull-Renaults on the grid. With Vettel leading, the second Red Bull Racing car of Mark Webber fell under attack of the Ferrari belonging to Fernando Alonso. Alonso passed Webber spliting the Red Bull-Renaults through the opening laps of the Hungarian Grand Prix. On lap 23, a major 2010 championship event occurred as Lewis Hamilton's McLaren-Mercedes lost power. Entering the Hungarian Grand Prix as the drivers championship points leader, Hamilton left the race just prior to 1/3 race distance. A rough day overall for McLaren, Jenson Button would finish 8th in the race after struggling to find speed for much of the race weekend. Out front, Sebastian Vettel built his advantage over the field leading by 11.7 seconds at one point. Unfortunately for Vettel, his interval on second place would soon be erased once a safety car was deployed. As a result of debris on track from both a collision between Robert Kubica and Adrian Sutil, a scary incident where Nico Rosberg's Mercedes GP car lost a wheel on pit road neccesitated the Mercedes-Benz SLS AMG safety car to gather the field. Making use of the period, many of the drivers were sent to pit road for service. However, in a mind-bending move, the Red Bull Racing stayed on track to take the lead. A radically different strategy from Vettel who had pitted, Webber was also running softer Bridgestone tires which were feared to be wearing out. With Webber remaining in the lead as the field restarted, Sebastian Vettel eased back on the accelerator allowing him to either gain more momentum to pursue his teammate or allow his teammate to run away and leave the field. This action is considered a violation of the restart procedure Cited to be a radio communication breakdown where Vettel would have been caught off-guard by the restart, the FIA nonetheless had the German bring his Red Bull-Renault down pit road to serve a drive-through penalty. As Vettel dropped down the running order, Webber led the grand prix and was in fact gaining major ground over the now 2nd place Alonso. With the softer tires holding together, Webber pitted on lap 43 with a 23-plus second lead allowing the Red Bull-Renault to hold top position. With the gap a deciding factor, Mark Webber won the 2010 Hungarian Grand Prix adding a 4th win to his breakout season. Joining webber on the podium, Ferrari's Fernando Alonso would come home 2nd and Red Bull Racing teammate Sebastian Vettel took 3rd place disappointed with the race-costing penalty. 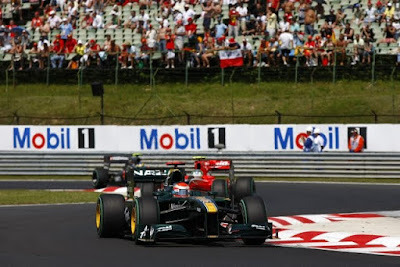 The second Ferrari of Felipe Massa would cross the line 4th at the Hungaroring in an important race for the Brazilian. A year following a nearly-career ending (perhaps life ending) on-track incident, Massa return in 2010 should filter out any remaining demons the driver has in Formula 1 racing. The winding corners of the Hungarian circuit also allowed two Formula 1 rookies to present their best runs of the season. Driving for Renault F1, Vitaly Petrov crossed the line 5th following up a strong qualifying run on Saturday. Nico Hulkenberg also brought has Williams-Cosworth to a 6th place result. Interesting enough, these drivers were 1st and 2nd last season in the GP2 series with Hulkenberg winning the 2009 GP2 championship. Along with strong efforts resulting for 2010 F1 rookies, veteran Formula 1 team BMW-Sauber, which started the season seriously in peril, also ended the day celebrating both cars within the top 10. BMW-Sauber's double point-scoring day, Pedro de la Rosa led the team past the line in 7th spot. Impressive, de la Rosa's teammate Kamui Kobayashi might be earning more respect following his 9th place charge. Overcoming a dismal qualifying effort as well as a team penalty, Kobayashi would hustle his BMW Sauber-Ferrari from 23rd to 9th at the line. With some Formula 1 drivers enjoying landmark runs in Hungary, one of the sport's legendary drivers is enduring another rough performance. For other Formula 1 race, the driving of returning 7-time F1 World Champion Michael Schumacher has garnered the scrutiny of the FIA stewarts. Remembering the illegal pass for position at the end of the Monaco Grand Prix earlier this season, this latest incident at the Hungaroring involved an on-track battle with former teammate Rubens Barrichello. Sparring in a aggressive fight for a prized 10th and final points-scoring position, the Mercedes GP of Schumacher exercised a reckless block on Barrichello's Williams-Cosworth through the Hungaroring's front stretch. Having played 2nd driver when the pair were teamed at Ferari, Barrichello found no reason to accept their previous arrangement sqeezing by for the 10th spot. Not only losing the point, Michael Schumacher will lose 10 grid places in qualifying for the next race at Spa as well as the racing credibility for undertaking this potentially-dangerous maneuveur. With his latest victory, Mark Webber leapfrogs the wounded Lewis Hamilton for the Formula 1 drivers championship lead by 4 points. Sahking up to become a tight fight for the 2010 drivers crown, Sebastian Vettel, Jenson Button and Fernando Alonso are within 20 points of Webber with 7 races to decide the victor. As mentioned before, the 2010 Formula 1 World Championship is on a extended hiatus until August 29th where they race the Belgium Grand Prix.